How about this! I promised you I would take a picture of my Special Toad in the Hole, if I thought it looked good enough, and here it is. It tasted fantastic and even Erik agreed with me. Not bad for someone with a wonky hand at the moment. 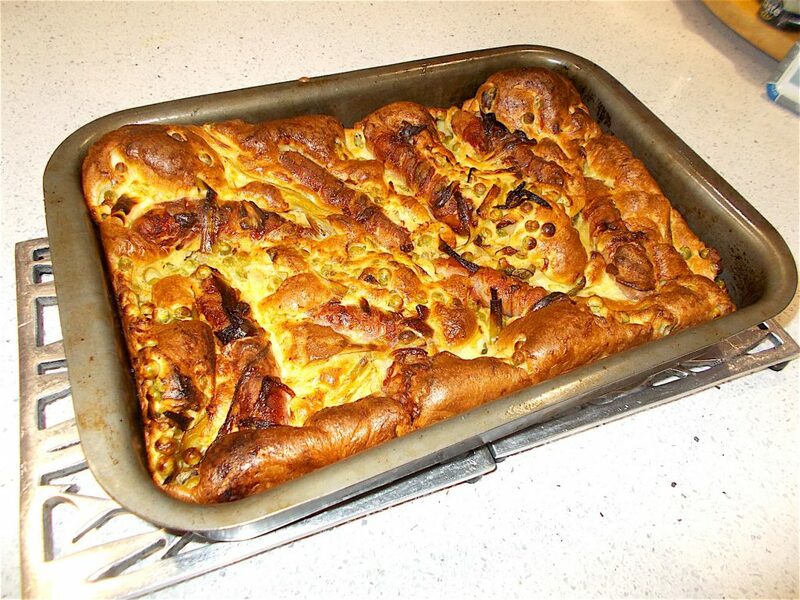 The addition of leeks and peas softened in white wine and added to the half cooked sausages really made it something special, so no doubt I will be getting gentle reminders to cook this Special Toad in the Hole again before too long. Perfect for this chilly wintery day. Now going downstairs to put together a Lamb tray bake – an “all in one” mixed with small parsnips, shallots, carrots and halved potatoes with a smattering of oil, a glassful of wine, thyme, garlic and anything else I think will enhance the flavour. Can’t wait for that one. I’ll be asking cook to arrange this supper. We have the vicar over this week as the rectory is being decorated. I know the vicar loves a hearty supper. Thank you Elsie. I do hope the cook did a good meal for yor nvicar. Regards, Astrid. Thank you Elsie. Hope the cook did a good job for the vicar. Regards Astrid.